Leftover spaghetti sauce? Eat it for breakfast! Ever since I was little, I LOVED spaghetti sauce. My mom would add molasses to the sauce to get my sister and I to eat it and ever since then, I have been hooked on that spaghetti sauce. Over the past year, I have been trying to incorporate vegetables into my breakfast. 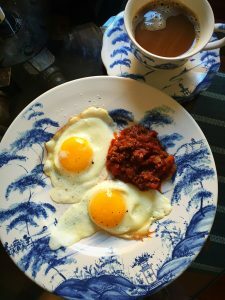 I walked into the kitchen that morning and remembered how good my spaghetti sauce was the night before so I thought, “I would really like some of that spaghetti sauce for breakfast.” But how to make it breakfast-y? Add eggs! The way the tang of the cooked tomatoes went with the creamy yolk was awesome. I suppose this is a take on the popular shakshuka which is basically eggs cooked in tomato sauce. I wouldn’t even mind a side of wilted fresh spinach with the dish to add even more vegetables. A piece of toast would also be a good addition, I just try to limit my carb intake. This dish as pictured is low carb, paleo, and delicious! My lovely china is by Juliska and in their Country Estate pattern in Delft Blue. Comments Off on Leftover spaghetti sauce? Eat it for breakfast! My husband John, a Lieutenant Commander in the United States Navy (recently selected for Commander!!! ), and I were married October 31, 2015. Since then we have lived in Annapolis, MD for just over a year while John taught at the Naval Academy, Newport, RI (for 3 months), and we are currently traveling around between his next duty station (Pearl Harbor), San Diego, and Dahlgren, VA where we are currently. Life has not been boring! The things I miss the most are my family (especially my sister), my doggie Dixie, and a kitchen. Fortunately where we are in Dahlgren (actually King George right next to Dahlgren) I have access to the kitchen here! The other night, John and I seared steaks. If you are anything like me, you have seen soooo many different ways of searing steaks. The different methods confuse me! Olive oil and butter…canola oil and butter….only butter….only olive oil….etc. Well for a while now I have been trying to figure out the best method and I think I may have found it. We bought local ribeyes from a butcher shop in Fredericksburg, VA (about 30 minutes from where we are in King George). They were about 1.5 inches thick. The first thing I did was season the steaks very generously with salt and pepper. The I preheated the oven to 350. Then I searched for a cast iron skillet but could only find stainless steel so I used that. I heated that skillet for about 5 minutes on medium high then added ONLY canola oil just enough to coat the bottom of the skillet. That skillet was really hot and the oil was smoking! I immediately placed the steaks carefully onto the really hot skillet and seared one side for about 3 minutes. 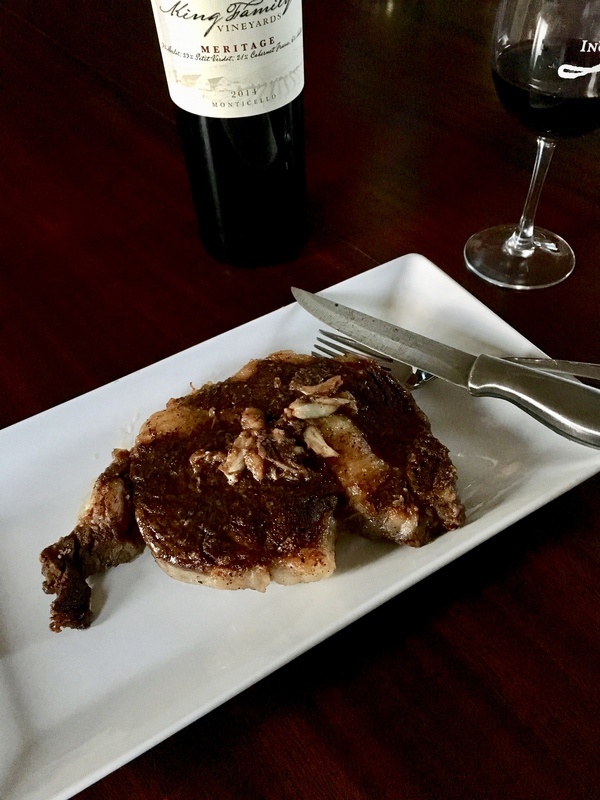 The steak did not stick to the skillet at all and I was really surprised! Maybe because I added the oil to the skillet after it was already hot? So after the 3 minutes I placed the skillet in the preheated oven for 10 minutes. I let the steaks rest on a plate for about 10 minutes. Then I added about 2 tablespoons of butter and 6 cloves of smashed garlic to the pan and cooked for about 5 minutes until the garlic was soft. I then poured that pan sauce over the steaks and served. I will take more and better pictures next time. Oh and also, the Virginia Meritage wine we had was a fabulous pairing with the steaks. Meritage is a typically a blend of at least two of the following grapes – Cabernet Sauvignon, Merlot, Cabernet Franc, Malbec, Petit Verdot. This particular Kings Family Meritage was a blend of 50% Merlot, 23% Petit Verdot, 21% Cabernet Franc, and 6% Malbec.